As “Reckless Heart” was being created, Bap Kennedy was in a losing battle with cancer, a battle that he has very recently lost. As far as a legacy goes for such a rich and varied career, a single album is never going to do it justice, but “Reckless Heart” is a masterfully crafted record, filled with hope, despair, beautiful melodies and soaring musicality. With hints of Rock ‘n Roll, Blues and two-step country, this record is a beautiful blend of traditional American music styles. It is so rare for someone to encapture this musicality coming from foreign shores, but Belfast-born Kennedy does just that, sounding not in the least bit inauthentic, a great credit to an artist who has spent his career associated with legends such as Steve Earle, Mark Knopfler and Van Morrison. Songs like ‘Good As Gold’ is a prime example of the versatility of this record, having a great swing feel to it, and the fact that it is followed directly by the Americana heartbreak of ‘I Should Have Said’ is one of the real treats of this record which spans over Bap’s long and fruitful career. ‘Help Me Roll It’ then takes the record into more Rock ‘n Roll musical style, harking back to the heady Memphis days of Sam Phillips and all the greats that recorded in Sun Studios and changed America, and the world, forever. ‘Henry Antrim’ then explores more of a Mexicano-folk style with heartbreakingly beautiful picking and gentle percussion backing. This is one of the real highlights of the record, really tapping into the emotional musical core that should be in the heart of every great record. Ending the record with ‘The Universe & Me’ and ‘It’s Not Me It’s You’ does feel like a farewell. Put in the context of Bap’s extraordinary musical life, these two songs are his swansong and much like Glen Campbell with ‘I’m Not Going To Miss You’ touching the subject of Alzheimer’s, ‘The Universe & Me’ feels like Bap is saying goodbye through the medium of Americana. “Reckless Heart” is a must-listen. It is an apt farewell for a great life, and also a great introduction to the music of such a fantastic writer and musician. With a unique blend of organic musical styles, Bap has left us musically better off, and for that we will remember him. 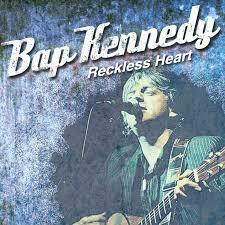 Bap Kennedy seals his legacy with a knockout album sadly released posthumously due to his sad death from a long cancer battle.